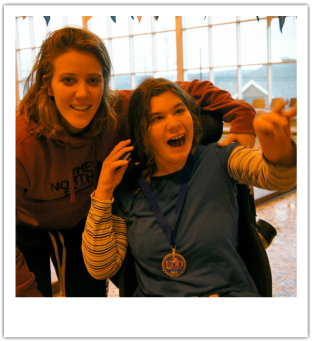 EDD Memorial Fund programs provide an opportunity for disabled and non-disabled community members to connect through sports. 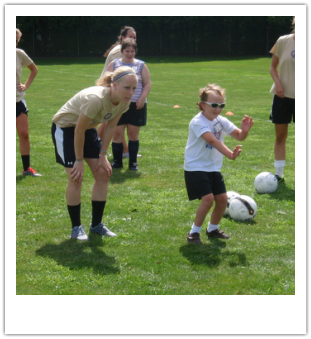 Each program volunteer is an accomplished athlete who wants to share his or her skills with others. They inspire the participants with their enthusiasm. We recruit many of our volunteers by partnering with college athletic teams in our communities. This partnership is a win-win for everyone. The participants have a great time interacting with the student athletes and the clinics provide a unique volunteer experience for college students. The volunteer experience compels college athletes to approach their sport in a new light and explore ways to make activities accessible. We also partner with other sports organizations like Otsego Area Rowing, Athelas Therapeutic Riding and the Adaptive Sports Foundation to offer additional programs. We are looking for ways to expand our programs by reaching new groups of volunteers. If you are interested in helping us to start an adaptive sports program in your area, please contact us. Program Volunteers – If you live in Central NY or VT and are interested in helping at one of our programs, please contact us. Special Event Volunteers – Would you like to help with our Benefit Dinner & Silent Auction in Oneonta, NY or our Dream Big 5K in Essex, VT? Please click here to send us a note. Set up a personal fundraising page to support our programs. Its quick and easy to set-up, and allows you to ask your friends and acquaintances for support. Are you interested in starting a program in your area? If you are part of a team, club or group that would like to start an adaptive sports program in your area, please contact us. There are many ways, large and small, that you can help the EDD Memorial Fund. Please contact us if you are interested in becoming more involved. Thank you!